Bendix (Bendix Commercial Vehicle Systems LLC and Bendix Spicer Foundation Brake LLC) contributed that quote – by Mae Jemison, the first female African-American astronaut in space – as part of its sponsorship of Women in Science Day at the Cleveland Museum of Natural History (CMNH), which took place Feb. 9. The event, in its second year, celebrated the contributions women from around the world have made to science with panels, hands-on activities, and special programs for 1,500 girls and boys. Jemison’s quote joined others in adorning exhibit tables as sources of inspiration for attendees. Bendix, the North American leader in the development and manufacture of active safety, air management, and braking system technologies for commercial vehicles, also participated in the event as an exhibitor to show how science, technology, engineering, and mathematics (STEM) impact our daily lives. 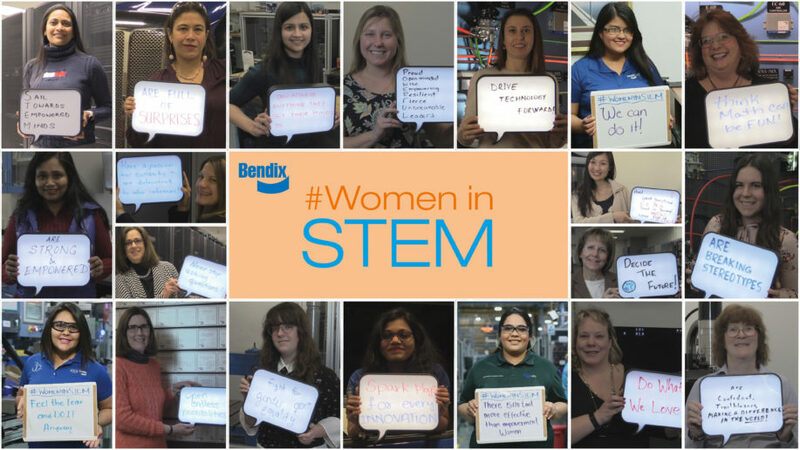 Eight women who work in STEM at Bendix helped to educate students through activities on sustainability, coding, and circuits. From providing firsthand exposure of engineering labs to sponsoring school maker spaces, Bendix is committed to inspiring future STEM professionals by helping to unleash their creativity and innovative spirit. And today, International Day of Women and Girls in Science, the tech leader is especially proud to celebrate its women in STEM and support younger generations in pursuing STEM careers. At the CMNH Women in Science Day event, Maria Gutierrez, Bendix director of corporate responsibility and sustainability, provided a welcome to introduce the Science Graduate Student Panel. Gutierrez, trained as a chemical and environmental engineer, aims to inspire young girls to pursue science and disband the myth that women in science don’t fit society’s expectations. Gutierrez is one of many women helping to shape Bendix’s future who have a technical background, work in a technical role, or both. A small sampling of others includes: Barb Albrecht, whose training in mechanical engineering has served her well as program manager for customer retrofit; Rebecca Carter, an industrial engineer who works as product manager for specialty valves; Cheryl Greenly, a trained electrical engineer who earned a law degree and serves as one of Bendix’s intellectual property attorneys; and Nicole Oreskovic, who brings her mechanical engineering training to bear in her role as product line director for air disc brakes. Bendix is committed to encouraging the next generation of STEM professionals in the communities it calls home. Through on-site programming, sponsorships, and employee volunteerism, it aims to raise awareness of the value of a STEM education and careers. To inspire students to explore science and technology, Bendix opens its door for students to learn firsthand what engineering is. In 2018, students from nearby Avon Lake High School visited Bendix’s Elyria headquarters for a day of plant tours, demonstrations, and hands-on activities to learn how engineers work on everything from design to testing. Younger students also have a chance to meet Bendix’s engineers and participate in engineering activities during the company’s annual Discover Engineering event. 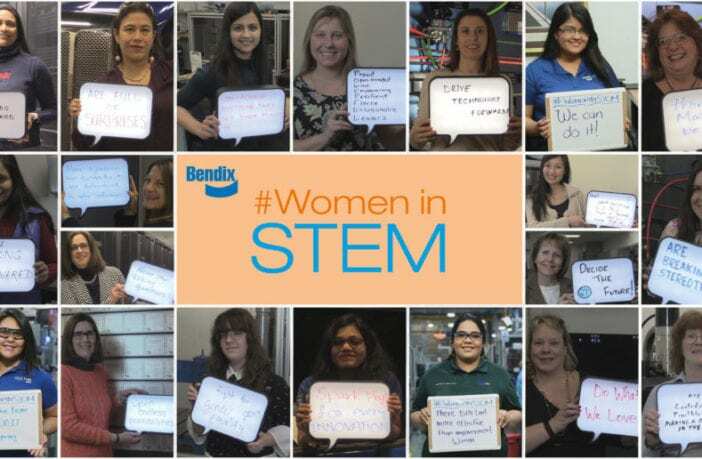 Bendix provides further support for STEM education by sponsoring events like CMNH’s Women in Science Day and donating funds for educational spaces. Last year, the company donated $12,500 to Elyria Catholic High School to create a maker space. The maker space is a collaborative classroom for students to develop STEM-related technology and entrepreneurial skills. Through donations from Bendix and other sponsors, the school was able to provide students with technology, including 3D printers, drones, a laser cutter, and an iPad® kiosk. The company has also contributed to the support of robotics teams, programs, and competitions across North America. And as part of a long-standing tradition of giving back to their communities, Bendix employees go above and beyond to support the education of future STEM students and professionals. Employees consistently contribute their time and talents to assist with student visits, volunteer as mentors, and submit educational projects for corporate grants through the Get Involved! program. Barb Albrecht works regularly with students at the high school and college levels to offer guidance and insights from her 26 years at Bendix. “I see it as a way of keeping in touch with the engineering community and helping to transfer my experience to others who are just beginning their careers,” she said. Bendix employs approximately 300 engineers performing R&D, design, quality, manufacturing, testing, and technical sales support roles to assist in the production of the company’s integrated active safety, air management, and braking system technologies.